Spend your summer on Cannonball Island! Always believing she was an ugly duckling, Chrissy Jenkins thought she had finally turned into a swan when her real-life Prince Charming swept her off her feet. But as his true character began to crack his perfect facade, Chrissy realized that not only was she better off without him, but that she was the only one who had the power to transform her life. Returning to her ancestral home on Cannonball Island for a family wedding, Chrissy is reintroduced to a legacy she’d all but forgotten. In choosing to stay on the island, she reboots her life, successfully reinventing herself as a sous chef at the Inn at Sinclair’s Point just over the bridge in St. Dennis. But despite her newfound self-confidence, she still doesn’t trust her taste in men. So when she meets Jared Chandler, a handsome ship salvager staying at the inn while he conducts a nearby recovery operation, Chrissy’s certain she can keep him as a friend—even though he’s everything any woman would want in a man. As fellow newcomers, together they discover the charm of the historic bayside town and explore the idyllic island. But when Chrissy agrees to be Jared’s date for his father’s wedding, they embark on a weekend that will find them each seeing the other in a completely different light, one that will change their lives forever. Mariah Stewart invites readers to Cannonball Island for another summer romance! In Dune Drive, Lis and Owen's cousin Christiana rediscovers her love of the island and herself. After escaping an abusive relationship she finds solace in the day-to-day routine of Ruby's store. She finds a place for herself in the kitchen at Blossoms and a friend in diver, and also newcomer, Jared Chandler. While things are looking up for Chrissy, the threat of her ex casts a pall over each step she takes to build herself up to the person she was before. I love that this story has an emotional start. The fear that followed Chrissy to Cannonball Island is believable and to see her change from timid to strong and sure is amazing. Dune Drive is a definite friends to lovers story. It's interesting to see Chrissy and Jared become friends because neither of them are looking for a relationship. It's a tender, slow burn romance that you won't be able to put down under threat of losing sleep for the night. Picking after the events of The Chesapeake Bride, after Lis and Owen's weddings, you'll feel as though you never left the idyllic island. Readers will find themselves once more enchanted by the characters in the story. They are inspiring, kind, and always willing to share their story with us! 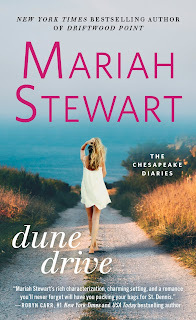 Dune Drive is perfect for fans of Robyn Carr and RaeAnne Thayne. You don't want to miss this marvelous entry into the Chesapeake Diaries! Chrissie stretched one leg as close to the water as she could and with her big toe traced her name onto the surface, the way she had when she was a child. The water was cold, true spring being just around the corner, and the chill ran up her leg, but it made her feel alive. Her brother, Luke, once told her that writing your name on the Chesapeake meant you were part of it, would always be part of it. She wondered where Luke was now, and if writing his name on the bay had brought him back from time to time. When their parents, Stephen and Dorothy, divorced, Luke went with their father, and one-year-old Chrissie stayed with their mother. As far as Chrissie knew, neither father nor brother had ever looked back. It was as if the earth had opened up and swallowed Stephen and Luke Jenkins body and soul, as far as she was concerned. Chrissie wouldn’t recognize either of them if they stood in front of her. Her father had been from the mainland and had no ties to the island except her mother. 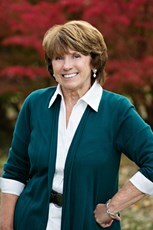 Once that bond had been broken and her mother remarried and moved to Pennsylvania, Chrissie figured her father had no reason to return. If her mother had heard from either of them, she’d never told Chrissie, and the few times Chrissie’d asked, her questions were ignored. To Chrissie, it was unforgivable on the part of both her parents—her mother for not telling her why her father left, and her father for never coming back. Once she’d started examining her life in earnest a year ago, it hadn’t been difficult for her to figure out that being abandoned by her father had contributed to the fact that her self-esteem had been so low she’d permitted herself to be abused. That her mother would never tell her why had only added to her poor self-image: as a child, she’d assumed he’d left because she was a bad girl. What other reason could there have been? Now, as an adult, she realized there’d had to be something other than that, that while children see everything that happens through their eyes as it relates to them, the constant arguing between her parents had probably been about something else. Try as she might, though, her mother would never tell her what that something had been. She still thought of her father with a mixture of anger and longing. Had he ever remarried? Was he still alive? And Luke . . . ? She had no idea if he was dead or alive, either.